After spending six years in a refugee camp in Ethiopia and giving birth to her youngest son there, Nedifo Halane arrived in Arizona in 2014. She was one of the 683 refugees from Somalia that year who found in Arizona their first home in the United States. Halane now works at a car rental company and her 10-year-old son, Abdirezak Abdi, switches between English and Somali in one breath. But his mom is the only family Abdirezak knows. He hasn’t met his father, Abdullahi Abdi Mumih, his brother Mahamud Mohamed, who’s 18, or sister Ifrah Mohamed, who’s 14. Refugees like Halane can request immediate family members to join them in the U.S. through something called an I-730 petition with U.S. Citizenship and Immigration Services. It is a common process for refugee families who were separated by the conditions they were fleeing. “To be able to bring your loved ones here to the US, to live with you here, to be safe with you here… I think it’s something we can all understand,” said Connie Phillips, president and CEO of the resettlement agency Lutheran Social Services of the Southwest. In September 2016, Halane filed that petition for her husband and two children. She’s still waiting for a decision. “Family always needs each other, family helps each other,” Halane said in Somali through a translator in her Phoenix apartment. She has dark, bright eyes and a thin red scarf with tassels covered her head and shoulders. Halane’s situation is one many refugees and immigrants face with increased restrictions to legal immigration, like longer processing times for immigration documents, increased vetting of refugees, and a ban on travel and immigration from countries like Somalia. Processing I-730 petitions took an average of about six-and-a-half months in 2016, according to USCIS. By December 2018, the time to review and adjudicate I-730 forms had increased to almost 10 months. Stanford Prescott, with the International Refugee Committee in Phoenix, said the resettlement agency still has multiple cases pending of refugees who petitioned their family to come to the U.S. in 2015 and 2016. Halane’s wait of 31 months and counting is not uncommon. Mustafa Haji, chairman of the Somali Association of Arizona, said many families in the state are in a similar situation. He called the wait a “tragedy” because the relatives of refugees are awaiting reunification in precarious conditions, and those in the U.S. yearn to build a better life here together. In the meantime, Halane is figuring out how to navigate this country, its culture and its systems, on her own, and her older children and husband wait in a refugee camp in Uganda. She is the sole breadwinner for the family. They talk everyday through messaging services Whatsapp and Facebook, she said. In the past five years, 2,525 refugees from Somalia resettled in Arizona, according to figures from the Arizona Department of Economic Security. 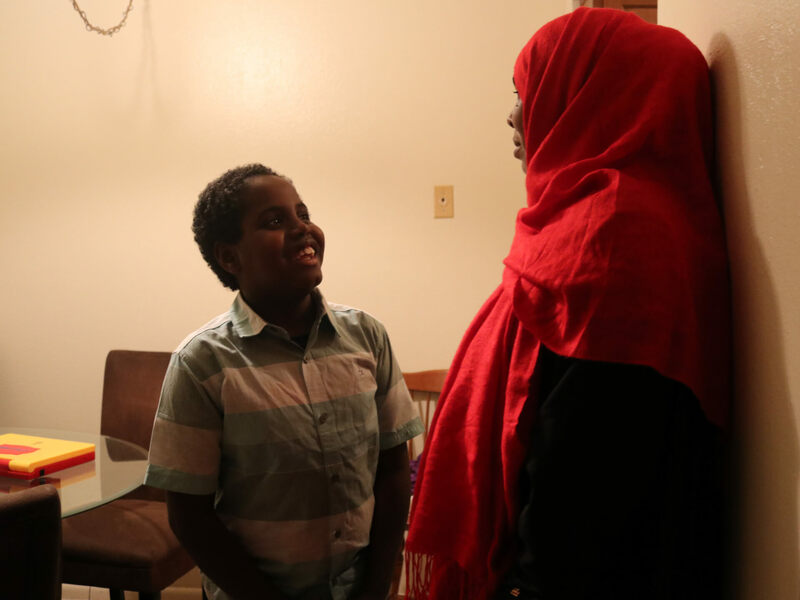 In fiscal years 2018 and so far in 2019, only 12 Somali refugees have found their first home in the US in Arizona. When asked if she knew why her petition has taken so long, Halane softly shook her head. Abdirezak, her youngest son, sat nearby on the couch in the living room, listening to the conversation. He giggled, and placed his hands over his mouth. “I know why… Trump,” he said, and added he spoke about it with other children at his school. He’s not wrong, Prescott, from the resettlement agency, said. In September 2017, Trump wrote, “The entry into the United States of nationals of Somalia as immigrants is hereby suspended,” in a presidential proclamation known by its critics as “Muslim Ban 3.0.” That proclamation also affected travel and immigration from Iran, Libya, Syria, Yemen, North Korea and Venezuela. While there are waivers on a case-by-case basis, Prescott said Halane’s family still has to undergo extensive vetting. “Through these policies, and by not going through them in a timely manner, we’re creating cruelty upon families that don’t need to be separated, and that hurts children, that hurts adults when they could be living successful and healthy lives here in the United States,” he said. And with the U.S. accepting record low levels of refugees, Prescott added the country is renouncing its role as humanitarian leader. In fiscal year 2018, 22,491 refugees were resettled in the U.S., roughly half of the 45,000 cap. “If the (Trump) administration is creating barriers that separate people, that is unnecessarily cruel and its arbitrary red tape against refugee families,” Stanford said. Halane smiles when asked what she would do when her family is together again. Reporter Laura Gómez Rodriguez covers state politics and immigration for the Arizona Mirror. She worked for The Arizona Republic and La Voz Arizona for four years, covering city government, economic development, immigration, politics and trade. In 2017, Laura traveled the length of the U.S.-Mexico border for “The Wall,” the Pulitzer Prize-winning project produced by The Arizona Republic and USA Today Network. She was named Best Investigative Reporter by Phoenix Magazine in its 2018 newspaper category and has been honored by the Arizona Press Club for Spanish-language news and feature reporting. She is a native of Bogotá, Colombia and lived in Puerto Rico and Boston before moving to Phoenix in 2014. Catch her researching travel deals, feasting on mariscos or playing soccer. Amplifying the voices of Arizonans whose stories are unheard; shining a light on the relationships between people, power and policy; and holding public officials to account.